Judy Rodman - All Things Vocal Blog: Vocal Strain: What is it? What can you do about it? Vocal Strain: What is it? What can you do about it? Vocal strain, like any other strain, is the overuse or misuse of the vocal cords. Only 1/2" to 1" long in adults, these little bands easily can be overblown. After just 20 minutes of screaming at a ball game, blood blisters can begin to form on them! The mucosal lining covering the vocal cords becomes irritated and inflamed, the sound of the voice becomes harsher, less controlled; you can even lose your voice completely for a time. You know it when you do it, don't you? Strain your voice, that is. Sometimes you want to pretend you didn't... that's just a temporary thing and if you ignore it, that uncomfortable feeling in your throat will go away. And sometimes, if you let it rest, it does go away, at least until you strain it again! But the truth is: if speaking or singing is important to you, vocal strain should NEVER be ignored! It matters immediately to the quality of your singing or speaking voice. It takes the focus off your communication and puts it on the throat discomfort and fear of what that feeling could mean. But the most important reason: Vocal strain is cumulative!! That means that unless you deal with the cause of vocal strain, it will build on itself. 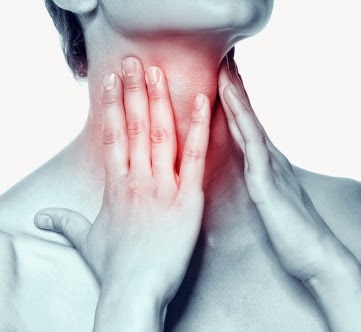 It can spiral down the slippery slope to serious vocal damage including nodes, polyps, hemorrhage and can even contribute to vocal cord paralysis. Ignoring the issue and continuing to speak or sing with vocal strain can also cause some very counterproductive operations of the vocal apparatus to become entrenched in muscle memory. A term for this is 'Muscle Tension Dysphonia'. This can be a very complex issue requiring medical diagnosis, sometimes sessions with a speech therapist, even surgery. Voice rest. Use the text messager service on your phone, and online (Facebook, etc.) At least severely cut down on the number of times you make any vocal sound. And when you do, make it a clear, bell-like tone. Avoid whispering, breathing tones at all cost. Drink like a big fish. Hydrate your cords... this is non-negotiable. Sleep. Get 8 hours or more... all week! Sleep is major cell-repair time. Practice new techniques to re-train your voice into healthier operation. Get your throat open and relaxed. Learn how to take pressure off your voice when you speak or sing. Learn to use the perfect balance of breath support/ breath control that leaves your throat feeling nothing when you use your voice unless you put your hand on it! Your vocal cords love to be buzzed, they hate to be blown! Your voice can be assessed for what is causing your vocal strain. Vocal lessons can re-train your voice with specific techniques according to your core causes of strain. You can tell it's a good lesson if you feel a diminishing of your vocal strain as soon as you apply the better technique. You should immediately experience a lessening of excessive air pressure, a more resonant sound and a healthy release of tension in and around your throat. You can be taught some kind of exercise to practice the new anti-strain vocal techniques. And finally, vocal lesson re-training should also apply to your speaking voice, because if you're like most people you speak a lot more than you sing. If you'd like to talk to me about a packaged course, Skype or in-office vocal lesson, let me know! Hello again! I don't mean to bother you but I have another question. I just sang for a while but my voice feels like it wants to just give out? The feeling of control is almost gone and I'm not really sure why. I have some theories but I'm not sure...could it be the past few days I haven't been drinking as much water, letting mucus build up? Maybe overuse throughout the day? For example, if I'm going for a high note, sometimes it comes out ok and others it feels like it's right on the verge of cracking, or it actually will crack. I would just like to know your opinion because I'm really looking for a solution or at least an understanding of why this is happening. Anyway, Thank you!! Also, lately, I haven't been getting nearly enough sleep, but would that affect my voice that drastically? Dear Sam, you really need to get with a coach who can observe you singing and diagnose what you're doing counter-productively that is producing fatigue . Then you can be directed with insight instead of guess work. Ya...you're right. It's just hard because we just don't have any money for that stuff and my parents think that me singing is a joke. You're the only person I have to ask and I just want to gather as much information as possible so I can do it right but problem after problem keeps coming up. But thanks again! I'm a soprano, and I've been taking lessons for a while. I recently decided to prep a piece of music which sits very high in my range before singing it for my instructor. I felt fatigue/some soreness the day of, but the next day it got much worse. My voice felt tired, sore and tight, and I developed a strange "clicking" feeling when swallowing. It's been a few days now, and it doesn't feel much better and the clicking is still there. I saw my ENT and he said there were no polyps or anything concerning, but that doesn't explain how awful my throat feels. What should I do? Is complete silence and good hydration enough to combat a single (albeit large) vocal insult? How long should play it safe? What's Wrong With Your Vocal Warm-up? Singing While Old: How Vintage Voices Can "Rock"